The Pinterest 100 annual list shows the man bun is out, Detroit is usurping Brooklyn as the hip style location, Kyoto is a must-visit, vegans are in and jackfruit is the new meat, navy is the new black, and Tuesdays are all about tacos. SAN FRANCISCO: Pinterest has unveiled its 100 top ideas to try in 2017. The social media website announced The Pinterest 100, a list of the year’s top emerging trends culled from its 150 million users, on NBC's Today Tuesday morning. The broadcast component of the story was handled via dozens of news stories pitched to an array of consumer lifestyle media, technology, and trade publications. This is the third iteration of the trend list, and the first to have a global scope as well as a broadcast component, according to Christine Schirmer, head of PR at Pinterest. In the past, the story was primarily online and print-driven, she said. "One [goal] is to share all the insights happening on Pinterest and the things pinners hope to discover and do in 2017," Schirmer said. "Another is [to share] a bit of fun news and [be] a positive place for the Internet, particularly this year." The Pinterest 100 had three major takeaways: People use Pinterest for their personal benefit, not for others, serving as a DIY website of sorts; 75% of content comes from businesses and brands' ideas are actively sought out on the platform; and people use Pinterest to browse and shop for products. The site claims businesses that use promoted pins experience five times more in-store sales than the industry average. Insights were taken from the U.S., U.K., France, Germany, and Brazil. Schirmer explained Pinterest localized the report to those five regions. Allison+Partners is assisting the campaign in the U.S., and the company also worked with BeyondPR as a consultant for the appearance. Today, more than 50% of its more than 150 million users are based outside the U.S., and one-third of all new sign-ups are men. "Local content has been key to growth internationally," she added. "We see regional and global differences in the types of things people are pinning." The 2017 trend report is broken down into 10 categories: food and drink (its largest category), home décor, women’s style, hair and beauty, men’s style, travel, wellness, kids and parenting, hobbies and interests, and events. Noteworthy trends include jackfruit as the latest meat substitute, navy is the new black, bell sleeves are going to be big for women, and no-heat hairstyles are en vogue but the man bun is definitely out. Brooklyn's luster is fading but Detroit is in, Kyoto is the hot travel destination, snow is in instead of the beach, and morning cold showers complete the cooling theme. Adventure travel is winning out over romance, therapists are waning in favor of energy healing, and spa water is being replaced by detox tea. Taco Tuesday is taking over, cultural wedding traditions are a thing, and celebrity airport style is usurping the red carpet. Evolving tastes of the platform’s users are also reflected in the categories represented in The Pinterest 100. Last year, the list included gardening, art, and technology as categories. This year, the list has hobbies and interests and events, and broke off men’s style and grooming as its own category, according to Erin O'Brien Maslan, consumer comms manager at Pinterest. "Last year, in female style it was all about shoulder cut-outs — we called it the ‘cold shoulder’ — and this year it’s about the statement sleeve. We see tremendous growth in vegetarian and vegan recipes," Schirmer said. Schirmer identified emerging celebrities such as lifestyle blogger Oh Joy! 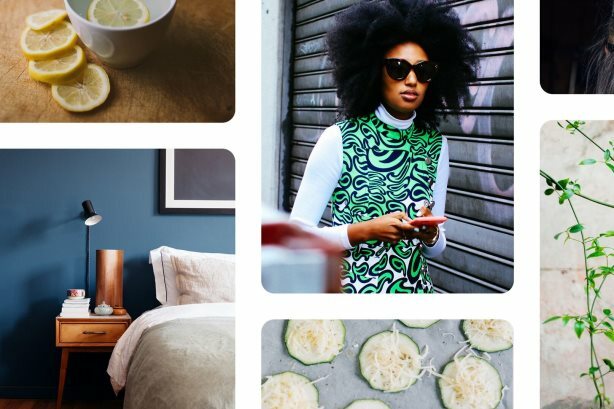 as a strategic partner for Pinterest, adding the company is also working closely with researcher and in-house stylist Larkin Brown. "In terms of new media components, we are working with outlets for digital video opportunities that highlight the trends," said O'Brien Maslan. This story was updated on December 15 with additional information.